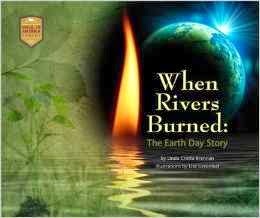 I'm restarting the Environmental Book Club this Earth Day month with When Rivers Burned: The Earth Day Story by Linda Crotta Brennan. This is a lovely book with all kinds of illustrations--photographs, drawings, charts, and text boxes. I feel a little superficial talking first thing about how the book looks, but appearances make a book easier to read, particularly a nonfiction book. When Rivers Burned was also brought out by a smaller publisher, and its appearance is an example of how nice a product they can turn out. Crotta Brennan does a good job here laying out her material as a narrative. She begins with the pre-Earth Day problems that led to the activism that led to the political action that led to Earth Day. It's not just an environmental book, it's a good beginner nonfiction book. I can see this book being recommended to upper elementary students so they can learn what nonfiction should be and how they should read it. Only one quibble here--No footnotes or endnotes or bibliography. However, over the last ten years or so I've been seeing nonfiction without footnotes. So there may be something going on in nonfiction publishing that I'm just not aware of. Transparency issue: I do know Linda Crotta Brennan in a say-hello-at-a-conference sort of way. I got this book through the library, not through Linda or her publisher. Thanks for featuring WHEN RIVERS BURNED on your Environmental Book Club! I'm honored. It's an excellent choice for this book club project.